Michigan counties have overwhelmingly selected Dominion as their vendor of choice! In December 2016, Democracy Suite was ranked first out of 5 major voting system vendors by the Michigan Bureau of Elections. Read the full evaluation here. To date, 64 Michigan Counties have selected Dominion as their election system provider, and will be implementing the Democracy Suite solution in 2017-2018. “Dominion’s technology provides substantial operational efficiencies, transparency and cost-savings, while maintaining a high level of security to deliver accurate elections and fast results,” Wayne County Clerk Cathy M. Garrett said. “I believe that the Dominion system will provide an improved voter experience, and I am confident that the decision to go with Dominion will serve Wayne County best”. The system includes the ImageCast Precinct, the most widely deployed optical scan tabulator in the world and the ImageCast X Ballot Marking Device, a universal voting device that offers a range of accessibility options. The system also includes Dominion’s flexible and scalable central count solution, the ImageCast Central. The entire system is powered by Democracy Suite EMS, which is the leading elections technology platform in providing end-to-end election management for all pre-election and post-election tasks. Dominion is excited to work in partnership with the counties in Michigan to help ensure their elections are accurate, transparent, and accessible. Dominion Voting Ranked Highest by Michigan Bureau of Elections! The system includes Dominion’s ImageCast Precinct, the most widely deployed optical scan tabulator in the world, and the ImageCast X Ballot Marking Device, a universal voting device that offers a range of accessibility options so all voters can vote privately and independently. The system also includes Dominion’s flexible and scalable central count solution, the ImageCast Central. Jurisdictions in Michigan can decide between the Canon DR-G1130 scanner and Canon DR-M160ii scanner, depending on their needs. The entire system is powered by Dominion’s Democracy Suite Election Management System, the most robust and secure suite of integrated software applications to perform all pre- and post-election tasks. Dominion Voting is excited to share this news and looks forward to working with all Michigan Customers to provide a voting system to meet all their needs. Every Election Day, Dominion is proud to support our customers across the country in delivering transparent, accurate, and fair elections. On November 8th, millions of voters across 33 states in the U.S. cast their ballots using Dominion technology in one of the most historic elections to date. To ensure Election Day ran smoothly, Dominion deployed hundreds of employees nation-wide to support our customers. “Dominion is honored to partner with such hardworking and dedicated election officials to support and enhance the democratic process,” said Dominion’s CEO John Poulos. The General Election also saw several firsts for Dominion’s customers, including counties in the State of Colorado and the Commonwealth of Puerto Rico, all of which successfully held elections using the Democracy Suite EMS platform. In December 2015, Colorado chose Dominion as the statewide voting system provider, and this year, eighteen counties made the transition to Dominion’s Democracy Suite. 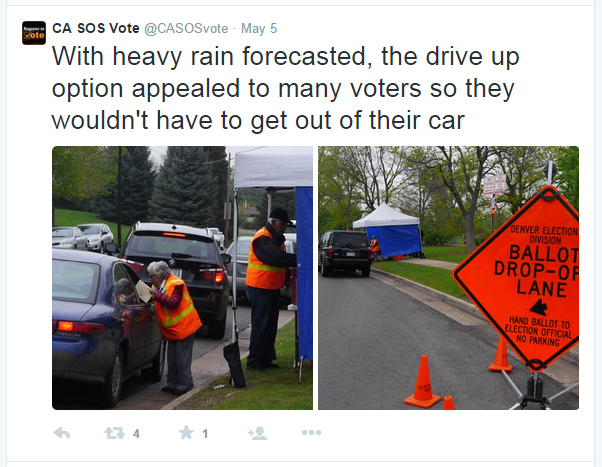 After a successful round of Primary Elections in June 2016, Dominion and county officials were prepared for the expected turnout for the General Election. The Democracy Suite system made it possible to seamlessly support all voting channels, including mail ballots, in-person voting, and accessible voting. Dominion’s newest in-person voting terminal, the ImageCast X, was used for in-person and accessible voting. The ImageCast X proved to be a truly universal voting device that offered a range of accessibility options, while allowing all voters to use the same device to vote privately and independently. The eighteen counties using Democracy Suite accounted for 46% of ballots cast in the General Election in Colorado. The majority of those 1,315,614 returned ballots were tabulated on the ImageCast Central before Election Day, making it possible for election officials to release unofficial results on Election Night shortly after polls closed. Dominion’s ImageCast Adjudication module allowed bi-partisan teams of election judges to review ballots in real-time, which significantly reduced the number of ballots requiring manual duplication and ultimately saved the counties’ time and resources. The ImageCast Adjudication module produced Dominion’s patented AuditMark on each adjudicated ballot, making the ballot-level auditing process easier and more transparent. In August 2015, the Commonwealth of Puerto Rico made the decision to move from manual hand-count elections to automated voting, and selected Dominion as their vendor of choice. In preparation for the Election, Puerto Rico deployed over 6,000 of Dominion’s ImageCast Precinct tabulators and launched a successful voter outreach campaign to ensure that voters knew what to expect at the polls. The comprehensive Democracy Suite system allowed Puerto Rican election officials and voters to experience an enhanced voting process. Dominion’s AuditMark technology increased transparency by providing a clear ballot-level audit trail, without compromising the confidentiality of the voter’s ballot. The Democracy Suite system allowed Puerto Rico to rapidly report unofficial results in record time, thanks to the secure, encrypted results transmission from the polls to the central office. In today’s election market, Dominion sets itself apart with a commitment to customer service and a superior use of technology to provide our customers with the best tools possible to solve their election challenges. Dominion is proud to have worked alongside our customers in delivering a successful General Election, and is honored to help facilitate the exercise of democracy across the nation. 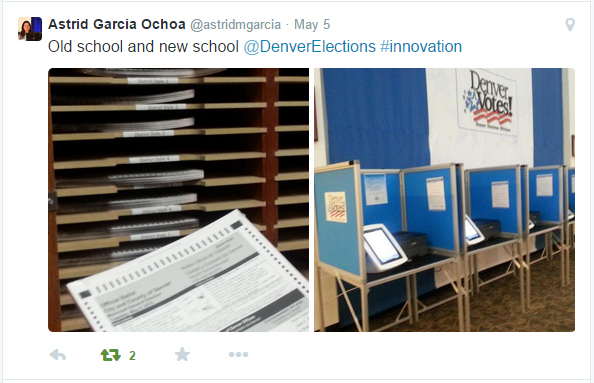 Colorado has chosen Dominion as the sole provider of Colorado's Uniform Voting System. Dominion was the top choice of a committee looking at voting options for the state. On December 22, 2015, Colorado Secretary of State Wayne Williams announced that Dominion Voting Systems has been chosen as the sole provider of Colorado’s Uniform Voting System following a multi-year, competitive and transparent selection process. The adoption of a Uniform Voting System is part of the State of Colorado’s modernization efforts to improve the elections process and voter experience. The Colorado Pilot Election Review Committee, or PERC, evaluated four different voting systems piloted in eight Colorado counties for the 2015 Coordinated Election. The City and County of Denver and Mesa County successfully piloted Dominion’s Democracy Suite voting system with the platform’s latest innovations, including Dominion’s newest in person voting terminal, the ImageCast X, a truly universal voting device. Democracy Suite leverages commercially available off-the-shelf hardware to deliver a better experience to voters, as well as sustainability and greater efficiency for election officials. Committee members had an important and challenging decision before them, and following this uniquely competitive and comprehensive evaluation process, all committee members recommended Dominion with overwhelming and unanimous support. "The State of Colorado is to be commended for their commitment to enhancing the voter experience through innovation, and for running a truly transparent process with a full set of election stakeholders. Dominion is honored to have been selected as Colorado’s partner of choice, and is proud of its innovations that have been in large part defined in partnership with our current customers. The State of Colorado and the Secretary of State’s office will undoubtedly continue to lead the way for other States looking to enhance and modernize their voting processes,” said John Poulos, President and CEO of Dominion Voting. Read the full press release here, or download a PDF copy here. The Central Electoral Commission of the Commonwealth of Puerto Rico has selected Dominion Voting Systems to provide election automation technology and services. Dominion’s Democracy Suite elections technology platform will be implemented in Puerto Rico’s elections in 2016. Dominion Voting is pleased to announce that, following a competitive RFP process, it has been selected as the voting system vendor of choice for Puerto Rico. On Monday August 31, 2015, Dominion Voting and the Puerto Rico State Elections Commission (CEE) entered into a contract agreement for the provision, delivery, installation, support and maintenance of Dominion’s Democracy Suite® voting system. Democracy Suite® is the leading secure, transparent, accessible and efficient elections technology platform, certified by the U.S. Elections Assistance Commission to 2005 Voluntary Voting System Guidelines. This comprehensive Democracy Suite® system offers several unique features to enhance the voting experience and process in Puerto Rico. Transparency will be improved through the use of AuditMark®, an exclusive patented Dominion technology which provides a clear ballot-level audit trail, without compromising the confidentiality of the voter’s ballot. This feature not only ensures that voter intent is accurately captured, but also provides a platform for ballot adjudication and review should it be necessary. The Democracy Suite® system, used widely across the United States and Canada, will also allow the CEE to rapidly report unofficial results at the end of Election Day, thanks to the use of secure, encrypted results transmission from the polls to the central CEE office. The Democracy Suite® system purchased by the CEE includes 6,075 ImageCast® Precinct tabulators, the world’s most widely deployed and reliable optical scan tabulator. The ImageCast® Precinct tabulator, which has been used in harsh environments including high humidity tropical areas and mountainous deserts, is a lightweight, compact and robust optical scan tabulator which will serve the needs of Puerto Rican voters for many years to come. In addition to the industry-leading technology described above, Dominion will also provide expert project management and professional support services to ensure a smooth and efficient transition to the new system. Democracy Suite certified in Wisconsin! Dominion Voting is pleased to announce that Dominion’s Democracy Suite voting system has been certified for use in the State of Wisconsin. The certified system includes Dominion’s universal all-in one optical scan tabulator and ballot-marking device, the ImageCast Evolution, as well as the ImageCast Precinct, the most widely deployed optical scan tabulator in the world. Both the ImageCast Evolution and ImageCast Precinct will be available in their ADA configurations for the state of Wisconsin. The certified system also includes Dominion’s flexible and scalable high-speed central count solution, the ImageCast Central. Democracy Suite supports modeming of unofficial election night results, and all results consolidation takes place out of a single unified database. The entire system is powered by Dominion’s Democracy Suite Election Management System, a robust and secure suite of integrated software applications to perform all pre- and post-election tasks. Before any voting system may be used in the State of Wisconsin, it must be approved by the Government Accountability Board and must also be federally certified by the U.S. Election Assistance Commission. The Wisconsin Government Accountability Board was established in 2007 to continue the state’s tradition of transparent and open government. The Board works closely with municipal and county election officials to ensure the integrity of elections, including approval of all voting systems. As part of the certification process, all voting equipment and materials were reviewed by Government Accountability Board staff and an advisory panel of local election officials. Board staff set up and conducted three mock elections using every component of Democracy Suite to ensure that the voting system conforms to all Wisconsin requirements. Dominion Voting also gave a demonstration of the system for members of the public, including persons with disabilities and legislators. Dominion Voting has been providing election support and services to customers in Wisconsin for more than a decade, and is looking forward to demonstrating Democracy Suite to the counties and municipalities in the coming months. With the introduction of our newly certified suite of technology, our seasoned support and sales teams stand ready to ensure your jurisdiction’s elections continue to run transparently, efficiently, economically and accurately. DENVER, June 2015 – Dominion Voting is pleased to announce that the City and County of Denver has completed their 2015 Municipal Election cycle using Dominion’s Democracy Suite voting system with resounding success. The system deployed as a pilot for the municipal election featured the platform’s latest innovations, including the first-ever deployment of Dominion’s newest precinct-based voting terminal, the ImageCast X, a tablet-based ballot marking device. The entire election was driven by Dominion’s fully integrated Democracy Suite software platform. 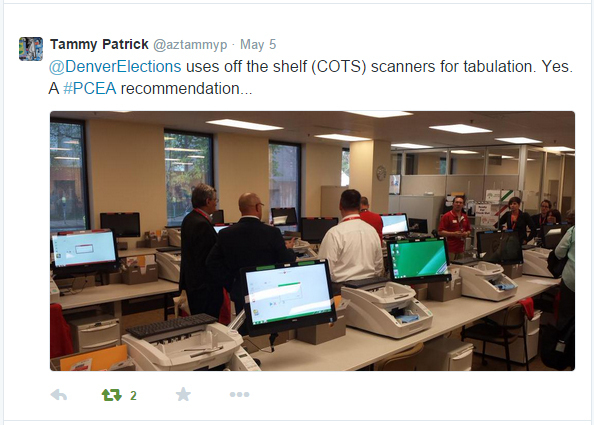 The system leverages commercially available off-the-shelf hardware to deliver greater convenience, transparency, and accessibility to Denver voters – as well as sustainability and greater efficiency for Denver Elections – ultimately leading to significant cost-savings for its constituents. The City and County of Denver streamlined their election processes by replacing their voting system - which required three vendors and seven different databases - with a single database to power the entire election – Democracy Suite. As a result, Denver Elections attained a 70% cost-savings in the counting room as compared to the 2011 Municipal Election. Efficiencies were realized thanks to Dominion’s ImageCast Adjudication software, which allows for real-time multi-user digital adjudication of ballots with outstack conditions, as ballots were being tabulated by ImageCast Central, Dominion’s central counting solution powered by state-of-the-art Canon scanners. A total of over 130,000 ballots – all ballots cast in both the May and June elections – were tabulated on the ImageCast Central, with staff processing an average of 4,000 ballots an hour. Dominion’s Democracy Suite system made it possible to support all voting channels, whether mail ballots, overseas and military ballot delivery, accessible voting for residential facilities, or in person voting at Voter Service and Polling Centers. The response from national observers was enthusiastic. On May 4th and 5th, Dominion Voting and Denver Elections hosted over 150 individual guests, representing 55 organizations and jurisdictions from across the country, to observe the municipal election and learn about the latest innovations to improve election administration, and, most importantly, the voter's experience. The Province of Ontario recently committed to providing municipalities with the option of using Ranked Ballots in future elections, starting in 2018, as an alternative to the current system. As Ontario's largest provider of election automation systems, Dominion Voting understands the challenges of new voting methods. If your municipality wishes to implement Ranked Ballots in the 2018 election, Dominion currently has ranked voting features available on our systems, as well as the support and services you need to ensure a smooth and successful transition. Please contact us at [email protected] if you would like to discuss the various Ranked Ballot options we offer. Democracy Suite - now available in California! Dominion Voting is pleased to announce that Dominion’s Democracy Suite voting system has been certified for use in the State of California! 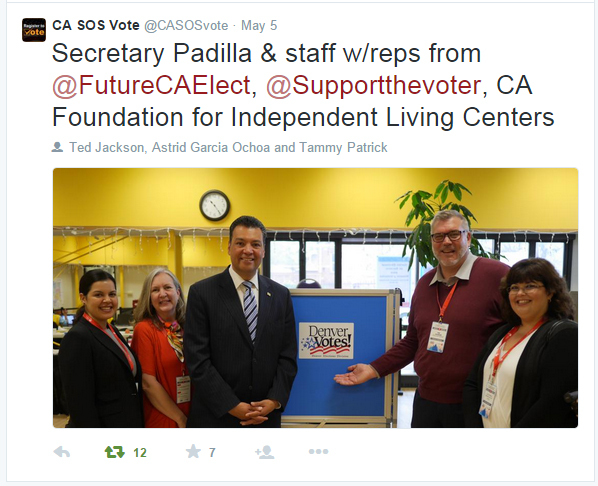 The Democracy Suite system is the first system to be certified in California since 2008. Many of the voting systems currently in use in California are decades-old, and Dominion is looking forward to bringing new voting technology to the state. The certified system includes Dominion’s universal all-in-one optical scan tabulator and ballot marking device, the ImageCast Evolution, as well as Dominion’s absentee ballot counting solution, the ImageCast Central. These tabulation solutions are supported by ImageCast Adjudication, Dominion’s digital tool which allows for real-time, efficient, reliable multi-user adjudication of ballots with outstack conditions. The entire system is powered by Dominion’s Democracy Suite Election Management System, a robust and secure suite of integrated software applications to perform all pre- and post-election tasks. As part of the accessibility examination and testing, the Secretary of State conducted an exit survey on the voters who participated in the Accessibility Test regarding their voting experience using the ImageCast Evolution. A majority of the participants found that the voting system would allow them to vote privately and independently. The all-in-one capabilities of the ImageCast Evolution enable every voter to vote on the same device, with the same paper ballot. Voters must be confident their votes are being recorded accurately and that their privacy is upheld. Voters must also be able to trust that the voting equipment in their jurisdiction is secure and that the integrity of the election is maintained throughout. Through the rigorous examination and testing undertaken by the California Secretary of State’s office, Dominion is looking forward to providing voters and election officials with this level of confidence in the security, accuracy, and accessibility of the system. Welcome to the ImageCast Family, Missouri Counties! Dominion Voting warmly welcomes nine Missouri counties to the ImageCast family, including Osage County, Callaway County, Crawford County, Gasconade County, Jasper County, Maries County, McDonald County, Newton County and Warren County! We are pleased that these customers will be supported by our Missouri-based partner, Elkins-Swyers, who has a long-standing history in the state. Time and again, customers have praised Elkins-Swyers’ outstanding customer service, and spoken of the confidence that they have in Elkins-Swyers’ ability and commitment to deliver timely and substantial election support. Dominion looks forward to working closely with Elkins-Swyers to ensure that they and our new Missouri customers have the support they need to successfully implement and use their new system. Elkins-Swyers is committed to serving its customers with high-quality election technology, using Dominion’s Democracy Suite. This year, these Missouri counties will deploy approximately 200 accessible ImageCast Precinct tabulators (ICP-BMD), the world’s most reliable optical scan tabulator. The ImageCast Precinct tabulators are all powered by Dominion’s Democracy Suite® Election Management System, a robust and secure suite of integrated software applications to perform all pre- and post-election tasks. In conjunction with the specialized and dedicated services provided by Elkins-Swyers, Dominion Voting looks forward to continuing to provide outstanding election technology to our growing ImageCast users group in Missouri and further afield! On May 4th and 5th, Dominion Voting and Denver Elections were pleased to host over 150 individual guests, representing 55 organizations and jurisdictions, to observe the City and County of Denver's municipal election and learn about the latest innovations to improve the voter's experience. We were particularly honored by the presence of election officials from across the country, including the Secretaries of State of Colorado, California and Louisiana, as well as two of the U.S. Elections Assistance Commissioners. Thank you to everyone who was able to join us in Denver! Denver Elections has always made it their mission to put the Voter First, and make engagement in the democratic process easier, more convenient, and more accessible for all voters. Today, voters and election officials are increasingly looking to leverage everyday technologies to improve the voting process and experience. To translate this vision into a reality, the City and County of Denver turned to its long-time partner, Dominion Voting. Over the past few years, Dominion and Denver Elections have been working together to figure out new ways to take advantage of the power and flexibility of the Democracy Suite platform. These efforts have led to these latest innovations to meet the current and future needs of not only the City and County of Denver, but also other jurisdictions across the United States – a comprehensive system that delivers an improved experience for the voter, long-term sustainability, operational efficiencies, transparency, and cost savings – all using Dominion’s Democracy Suite platform. On May 4th, attendees had the opportunity to attend a special presentation at the Denver Art Museum hosted by both Denver Elections and Dominion. Denver Elections Director Amber McReynolds discussed the new Colorado voting model, and the City and County of Denver’s numerous first-in-the nation election innovations, including what these innovations will do to solve today's election challenges, and how they will better serve voters. Dominion also gave a technical demonstration and overview of the Democracy Suite platform, including the ImageCast X, the newest member of Dominion’s ImageCast family of precinct-based voting terminals. Follow us on Twitter! @dominionvoting, @denverelections, and @ambermcreynolds! Dominion is proud to be working in partnership with the City and County of Denver in spearheading ground-breaking and creative ways to improve the voting experience. Dominion is pleased to introduce the latest upgrade to Dominion's ImageCast Evolution! We listened to your feedback, and improved the all-in-one functionality of the ImageCast Evolution with a new add-on secondary monitor for independent, private ballot marking -- now accessible voting sessions can happen concurrently with ballot scanning. Take advantage of the universal, all-in-one functions of the ImageCast Evolution! Here is a short video that describes how the ImageCast Evolution with Dual Display works, and how it can help you save time & money. Save time, money, and storage space – only one machine for all your precinct voting needs! A secondary monitor allows for an accessible voting session to occur while the ImageCast Evolution is scanning paper ballots. The additional monitor is an affordable commercial off-the-shelf component built to industry-leading standards. Ballots marked in an accessible audio-visual voting session on the secondary monitor follow a single ballot path to the same ballot box as all other ballots – no “walk-around” and no ballot segregation. The dual monitor is easy to store, can be setup in minutes and does not require an additional power source. You can read more about this new feature in our product brochure, available here. To schedule a demo or to learn more, please contact [email protected]. Every Election Day, Dominion is proud to support customers across the country in delivering one of the most important elements of our democratic system. This year’s Midterm Election was no different, as Dominion deployed over 200 staff members and contractor partners to nearly 100 on-site customer locations, command centers and technical support sites across 30 states, to support all our customers in implementing another successful round of elections. One of the newest members of Dominion’s ImageCast user community is Harrison County, Ohio. Having been the partner of choice for Harrison County for many years, together Dominion and county officials achieved a flawless initial deployment under a very aggressive and condensed time frame. Between contract award in mid-August to Election Day on November 4th, Dominion provided the hardware and software components, conducted user and poll worker training, installed and implemented the new system, allowing Harrison County officials the confidence to conduct their election with peace of mind. On Election Day, for the first time in several years, voters in Harrison County cast paper ballots at the polling station. Previously, Harrison County voters had been using a touch screen voting system, but as this system neared end of life, Harrison County began investigating new voting solutions for increased accuracy, efficiency and accountability. They chose Dominion’s ImageCast Precinct optical scan tabulator, the most widely deployed optical scan system in the world. Voters responded favorably, finding the paper ballots easy to read and understand, and overall, a quick and simple process to cast their ballot. Over the past couple of years, several counties in Florida have also transitioned to Dominion’s Democracy Suite product line, taking advantage of exclusive Dominion innovations, such as our patented AuditMark system. Our AuditMark technology is the only system that can store an image of every ballot cast along with a record of how the system interpreted the voter’s marks. In Florida, Supervisor of Elections offices are required to conduct an audit after each election. With Dominion’s ground-breaking AuditMark technology, software independent risk-limiting audits are easily performed by a range of election stakeholders: observers, supervisors, candidates, advocates, and auditors. After this year’s General Election, all of Dominion’s Florida customers reported 100% accuracy of their election audits. Dominion is fully committed to producing the highest quality election products, from quality engineering to quality manufacturing. The critical nature of elections demands that system components, especially the equipment distributed to the precincts for use on Election Day, be rugged and reliable. The reliability of Dominion’s precinct tabulation system was evidenced on Election Day in Florida, as the tabulator units deployed functioned nearly flawless in the field, with a 0.17% replacement rate. In addition to their core function of scanning paper ballots, both the ImageCast Evolution and ImageCast Precinct tabulators integrate ballot marking capability for accessible voting, so that each county only had to deploy one piece of equipment to meet all their precinct voting needs. The ImageCast Evolution features a built-in ballot marking capability that allows ADA voting in the same manner, with the same ballot as all other voters. The ImageCast Precinct enables voters with accessibility needs to make their ballot selections through an audio interface, with the results recorded onto the tabulator’s memory cards. Dominion sets itself apart with a commitment to customer service and a superior use of technology to provide our customers with the best tools possible to solve their election challenges. Photo Credit: "Election Night in San Francisco" by GPS is licensed under CC BY 2.0. Deloitte has named Dominion to both the Technology Fast 500™ and Fast 50™ lists (for the third and fifth year, respectively), recognizing our success as one of the fastest-growing technology, media, and telecommunications companies in the United States and Canada. Since first being named to the Fast 50™ list in 2009, which celebrates technological innovation, entrepreneurship, rapid growth, and leadership, Dominion’s commitment to its customers, service and technology innovation has helped the company’s customer-base grow exponentially. Technology Fast 500, conducted by Deloitte & Touche LLP, provides a ranking of the fastest growing technology, media, telecommunications, life sciences and clean technology companies – both public and private - in North America. Technology Fast 500 award winners are selected based on percentage fiscal year revenue growth from 2009 to 2013. In today’s election market, Dominion Voting Systems sets itself apart with a commitment to customer service and a superior use of technology to provide our customers with the best tools possible to solve their election challenges. Dominion has distinguished itself by pursuing excellence in customer service by implementing a technical culture focused on achieving the highest levels of accuracy, reliability and transparency. Dominion is committed to producing the highest quality, most innovative election solutions and delivering the very best in professional and support services to over 1200 customers representing jurisdictions all over the world. With a population of roughly 700,000 people, the City of Winnipeg is the capital and the largest city in the province of Manitoba, Canada. On October 22, 2014, the 14th council of the City of Winnipeg was elected for the 2014-2018 term. Dominion Voting was pleased to once again partner with the City of Winnipeg to successfully deliver their 2014 municipal election. In many ways, the 2014 civic election in Winnipeg heralded several exciting firsts for the city. A total of 30,619 people voted at the advance polls, setting a record level of advance participation, beating the previous record from 2010. The election concluded with 235,455 votes cast, the highest number of votes ever cast in a municipal election in Winnipeg. Overall voter turnout was also the highest it has reached in a decade, at 50.23%, making it all the more important for the City to deliver a flawless election. Dominion is proud to have supported the City of Winnipeg, a long-time customer, and contributed to the success of this important event. The City of Winnipeg was an early adopter of voting technology. Wanting to increase accuracy, efficiency and transparency in the electoral process, in 2009 the City made a long term investment in Dominion’s Democracy Suite system, replacing their 1994-era technology. For their 2014 election, the City deployed 230 Dominion ImageCast Precinct tabulators to every polling location, and also made assistive voting devices available to voters with accessibility needs. The completely turnkey voting system allowed the City of Winnipeg to capture voter intentions quickly and accurately, and the integrated results tally and reporting functionality made sharing results with the public and the media efficient and timely. The City of Winnipeg wanted to provide the electors with many options for voting to make the process convenient, simple, and accessible. Advance voting took place over several weeks at Winnipeg City Hall, as well as several other community locations, including shopping centres, universities and colleges leading up to Election Day. Advance voting opportunities were also available in 178 senior’s residences, personal care homes, developmental centres and hospitals. In addition to providing ample voting opportunities, the City of Winnipeg also utilized Dominion’s Mobile Ballot Printing system to offer 29 convenient “Vote Anywhere” city-wide locations, giving people the opportunity to cast ballots at any polling station regardless of their home ward and school division. Using Dominion’s Mobile Ballot Printing system, election officials were able to quickly look up a voter’s polling subdivision, and print the correct ballot style on the spot, saving the City the additional printing costs associated with having to provide multiple ballot styles to every “Vote Anywhere” location. At the close of voting on Election Day, results from all of the City’s voting opportunities (advance polls, mail-in ballots, and Election Day polls) were quickly compiled, so that the highly anticipated unofficial election results were made available without delay, within two hours of close of polls. Dominion also worked with the City to customize their online results display, providing an attractive and user-friendly interface for up-to-the-minute results reporting for the public. Dominion Voting looks forward to continuing to support the City of Winnipeg’s democratic process, and working with the City to make their elections more efficient, secure, and accessible. Dominion Voting was proud to be partnering with Elections Alberta for the first time this past October to deliver advance voting tabulation services for four by-elections in the province. Elections Alberta used Dominion’s ImageCast Precinct tabulator as the main polling place tabulator, as well as the ImageCast Evolution for voters with accessibility needs. By-elections were held in four ridings across the province, in Calgary-Foothills, Calgary-West, Calgary-Elbow and Edmonton-Whitemud. Four days of advance voting took place from October 22nd – 25th and Election Day was on October 27th. Elections Alberta staff were trained by Dominion on how to operate the tabulators, and were provided election support for logic and accuracy testing, advance voting opportunities and Election Day. Before voting began, Elections Alberta invited members of the accessibility community to preview and test the ImageCast Evolution. It was met with great enthusiasm, and offered the option for voters with accessibility needs to vote completely independently and privately. In past elections, it often took hours to handcount and tally results, but at the close of polls on Election Night this time, Elections Alberta staff were able to quickly and accurately tally the results from the advance polls. A total of 9,698 ballots were cast by electors during the four days of Advance Poll voting in the four electoral divisions, and overall voter turnout hovered between 36-40% across the four ridings. While voter turnout was lower than typical general elections, it was significantly higher than the two federal by-elections held in June in Alberta. A full report on the by-election is expected to be published in the coming months. Elections Alberta is keen to continue leveraging technology in modernizing the voting process, and Dominion Voting looks forward to supporting this goal. On Monday, October 27th, millions of voters headed to the polls in municipalities across Ontario. Dominion Voting was proud to support nearly 100 customers across the province in holding another round of successful municipal elections. Dominion’s customers ranged from the smaller vote-by-mail communities of Georgian Bay and North Kawartha, to the much larger municipalities of Ottawa, Hamilton, Vaughan, and Kitchener. In addition to paper ballot tabulation, Dominion provided a combination of internet and/or telephone voting services to 23 municipalities, enabling nearly 850,000 eligible voters to cast their ballot remotely. Over 2,000 vote tabulators were deployed across the province, and Dominion personnel were available in the field and at our Command Center to provide timely support wherever needed. This year saw several firsts for Dominion’s customers, including ten municipalities that successfully held elections using only internet and/or telephone voting. One such example is the Town of Meaford, a mixed urban and rural municipality on the southern shore of Georgian Bay. This was the first time since amalgamation that Meaford used a system other than vote-by-mail. They chose internet and telephone voting for its convenience and accessibility, and entrusted Dominion with helping them deliver their first ever fully electronic election. The Town also invested in community engagement, and held a number of puplic information sessions with various community groups to spread the word about the new voting methods. Electors could vote online or by telephone from anywhere and at any time during their 11-day voting period. As of Election Day morning, more than 40% of eligible electors in Meaford had already cast their ballots using either the internet or telephone, and by the end of Election Day, that number had climbed to 50%. Several other municipalities in Ontario used Dominion’s internet and/or telephone voting services in addition to paper ballot tabulation, hoping to increase voter participation, accessibility and convenience by offering alternative voting methods. They were met with a great public response. In the municipality of Chatham-Kent, over 9,000 people voted at the advance polls, with over 7,000 of those votes registered over the internet. This is up from only 3,007 advance votes cast in 2010. Voters were encouraged at how simple, secure and easy the process to vote was, with one voter posting online that it only took 3.5 minutes to vote from the comfort of their home. The city of Guelph also offered internet voting as an advance vote option for the first time this year, and saw significant increases in their advance voter turnout. Nearly 11,000 out of almost 14,000 advance votes were cast online, and overall voter turnout increased from 33.9% in 2010 to 44.96% in 2014. In Burlington, advance voter turnout was nearly double compared to 2010 numbers, with a total of 11,072 advance votes cast, including 8,000 votes cast online. All three of these municipalities used a combination of online and paper ballots provided by Dominion, and were be able to tally results on election night quickly and seamlessly using Dominion’s robust and fully integrated Democracy Suite Election Management System. These municipalities also took advantage of Dominion’s integrated internet graphical results display, which allowed them to update results in real-time on Election Night. Across the province, results streamed in steadily after the close of polls, with many municipalities releasing full unofficial results within 30 minutes of close of polls. Dominion once again delivered compliant, efficient and reliable elections solutions for the province’s municipalities, and is proud to be facilitating the exercise of citizens' democratic franchise in Ontario for now over 10 years. Photo: One of Dominion's ImageCast Precinct vote tabulators in the City of Cambridge. During an official visit to the Balkans in early September 2014, Canadian Foreign Affairs Minister John Baird had the opportunity to visit Dominion Voting’s Belgrade offices on September 1st. Along with Canadian Ambassador to Serbia Roman Waschuk, Minister Baird heard about the successful technological partnership between Canada and Serbia. They were given a demonstration of Dominion Voting’s ImageCast Evolution with Dual Display, ImageCast Precinct and ImageCast Central tabulators, and got a sneak peek at some of our latest innovations. This year marks the 10-year anniversary of Dominion Voting’s engineering offices in Belgrade. A key pillar of Canada's current foreign policy is support to governance and democracy throughout the world. The ability to deliver timely and accurate results is critical to the success of voting processes at home and abroad. In Canada, Dominion works closely with the Department of Foreign Affairs, Trade and Development as a tangible example to the international community of Canadian governance and election technology expertise. In the photo, Dominion’s VP of Product Management and General Manager, Europe, Goran Obradovic, shows Minister Baird an ImageCast ballot and voting on the ImageCast Evolution. Photo credit: Canadian Department of Foreign Affairs, Trade and Development. Over the past few general elections, the province of Ontario has made great progress in its approach to greater accessibility, from closed-captioning and descriptive video, to special ballots and mobile voting locations. The accessibility of the electoral process is crucial to ensure that all voters are able to fully participate and exercise their democratic right to vote privately, independently and with dignity. Dominion Voting is proud to be Elections Ontario’s partner of choice in providing assistive voting technology for the province of Ontario. Before deploying Dominion’s technology in the field, Elections Ontario consulted with various members of the disability community, and conducted a pilot program in 2009 using Dominion’s ImageCast Precinct optical scan tabulator with accessible voting. Dominion’s technology meets the requirements of the Accessibility for Ontarians with Disabilities Act (AODA) and allows voters marking their ballot by hand and voters that require the assistive devices to process their ballots privately and in confidence. The pilot project was a success, and Elections Ontario has subsequently used Dominion’s voting technology for both the 2011 and 2014 general elections. In June 2014, Dominion Voting deployed 144 ImageCast Precinct tabulators with Ballot Marking Device add-ons in all Returning and Satellite Offices across Ontario. Dominion Voting also provided training, election programming, ballot production, and on-site support services for Elections Ontario. Voters who chose to use the accessible voting feature had the option of navigating their audio ballot in either English or French, and using one of three assistive input devices. Voters with limited or no vision could mark and generate a ballot by listening to audio commands and using an Audio Tactile Interface (also known as the ATI). Voters with mobility or dexterity challenges could listen to audio instructions and use paddle buttons or the sip and puff device to navigate through their ballot. In addition to enhanced accessibility, Ontario has benefited from other advantages of Dominion’s technology, including automated ballot tabulation to simplify the counting process, and digital ballot imaging. Every ballot scanned on the ImageCast Precinct is imaged and appended with Dominion’s patented AuditMark®, a digital record of how that ballot was interpreted by the tabulator. Dominion’s Dual Threshold Technology was also useful in helping to ensure clear voter intent when accepting ballots. If ballots were blank, had unclear vote marks, or overvoted contests, voters were given an error message and an opportunity to correct their ballot or cast it as is. One of Elections Ontario’s goals is to serve electors in a modern, responsive and efficient manner, and ensure that the process is transparent and impartial. The ImageCast Precinct tabulator provided the province with an all-in-one automated ballot counting device which produced results reports within a few minutes of close of polls on election night. Most importantly, the ImageCast Precinct with Ballot Marking Device provided the opportunity for all Ontarians, with or without accessibility needs, the ability to vote independently and privately. Dominion looks forward to continuing our partnership with Elections Ontario and working towards the goal of greater accessibility for all. In 2012, Guernsey County began searching for new election automation solutions for increased accuracy, efficiency and accountability. Dominion Voting is proud to have been selected as their elections partner of choice, and pleased to announce that Guernsey County, the first county in Ohio to use Dominion’s Democracy Suite® voting system, had a successful first deployment of their new election technology on May 6, 2014 for the county primary. Guernsey County’s new digital optical scan voting system includes the ImageCast® Evolution, Dominion’s all-in-one universal scan tabulator and ballot marking device, and the ImageCast® Central for absentee ballots. Both the ImageCast® Evolution and the ImageCast® Central are powered by the Democracy Suite® Election Management System, Dominion’s robust and secure suite of integrated software applications to perform all pre- and post-election tasks. In addition to its leading-edge technology, Dominion Voting also provided Guernsey County with assistance in training poll workers, database programming, technical support, testing and trouble-shooting, as part of the innovative customized Managed Service Plan pricing model that Guernsey County selected. Certified for use in the state of Ohio, the ImageCast® Evolution is the only EAC certified digital optical scan voting device that offers ballot-marking capabilities all in one device. Guernsey County used 40 ImageCast® Evolution units in their recent primary election in 35 precincts, replacing 162 of their previous TSX touch screen voting units. Despite changing voting methodologies (from touch screen to paper based optical scan), the Guernsey County election officials experienced minimal calls from voters and poll workers alike, demonstrating the engineered simplicity of Dominion’s Democracy Suite® system. At the end of Election Day, Guernsey County was one of the first counties to report results in the state. Dominion Voting looks forward to furthering our relationship with the Guernsey County Board of Elections, and will continue to work to make their county the standard for exceptional election management in the State of Ohio. Please contact Mark Beckstrand, Ohio Regional Sales Manager at (828) 301-7670 or by email, mark (dot) beckstrand (at) dominionvoting (dot) com, with any questions about our products, services, pricing, or the Managed Service Plan options. Dominion Voting is pleased to announce that Hamilton County, the first county in Tennessee to use Dominion’s Democracy Suite® system, had a successful initial deployment of their new election technology on May 6, 2014 for the County Primary. Hamilton County purchased a new, fully integrated, Democracy Suite® voting system from Dominion in late 2013 to replace their Premier AVOS system, purchased in 1998. Hamilton County’s new paper-ballot based system is composed of the ImageCast® Precinct optical scan tabulator, the ImageCast® Evolution universal, all-in-one optical scan tabulator and ballot marking device, and the ImageCast® Central system for absentee ballots. All of these scanners are powered by the Democracy Suite® Election Management System, a robust and secure suite of integrated software applications to perform all pre- and post-election tasks. Hamilton County has 130 precincts, and a little over 220,000 registered voters. They used 130 ImageCast® Precinct units on Election Day, and 10 ImageCast® Evolution for early voting. On Election Day, results were uploaded, tallied and reported by 9:35pm. Not only was Hamilton County one of the first counties in the state to report, but they were the first large jurisdiction to report. Dominion is very pleased to be the vendor of choice for Hamilton County, and looks forward to supporting many more successful elections in the coming months and years. Image at left: Hamilton County prepares for the election with an independently audited Logic and Accuracy test of their ImageCast® tabulators. Accurate census information is essential for city planning and delivering public services and infrastructure such as schools, roads, recreational facilities, emergency services, libraries, and elections. Having an accurate population count and city metrics also helps to ensure that the city receives appropriate funding from other levels of government, and can make informed decisions on the spending of those funds. For their 2014 Census, the City of Edmonton knew that they needed a partner they could rely on to provide exceptional customer service, cutting-edge technology, and results they could trust. The City of Edmonton is committed to making bold and intelligent technology choices and Dominion Voting is proud to have been selected as their partner of choice. Dominion Voting has provided paper census tabulation services to the City of Edmonton since 2005, and for the first time this year, Edmonton residents had the option to access and input their data for the biennial census using the city’s new, streamlined and easy-to-use Online Census System, developed by Dominion. Every residence in Edmonton received a letter with a secure access code and directions on how to securely enter their household census information via the Online Census System. “I am thrilled with how Edmontonians have embraced the online census,” said Laura Kennedy, Director of Elections and Census. Approximately 110,000 residents completed their census forms online (a 30% uptake) – a major milestone in the city’s plans to lead progressive change through innovative and new technologies. Completing the census online was optional, and residents were able to access the Online Census System from April 10th to April 27th. Census officials began going door-to-door on May 10th to count in Edmontonians who did not participate in the online census. Results from both the online and offline census were gathered from over 350,000 dwellings, and were then automatically tabulated and consolidated in Dominion’s eCensus Suite. Dominion Voting is the only company to offer completely integrated online and offline tabulation services, providing customers with a seamless census operation, from defining the census questions to results reporting. Edmonton is one of the first large cities in Canada to adopt an online option for completing their municipal census. Dominion is proud to be providing the technology behind this important e-governance project, and to be partnering with the City of Edmonton to deliver a solution that is accurate, convenient, cost-effective and environmentally-friendly. We are proud to announce that Dominion employees, coupled with the matching funds from the Company and the Canadian government, have donated over $12,000 towards relief efforts in the Philippines, following the tremendous damage caused by Typhoon Haiyan in November 2013. Although there is much devastation in the Philippines, fortunately donations continue to flow in from many countries, employers and individuals. Progress is being made, but there is much to be done. Following a competitive and highly demanding bidding process, Dominion Voting Systems has been selected as New Mexico’s electoral technology partner for the next eight years. The State of New Mexico will be replacing its ageing voting system with a fully integrated suite of Dominion products to meet the entire state’s electoral needs, including precinct voting, voting centers, early voting and vote by mail. In addition to Dominion’s vote tabulations systems, the state of New Mexico will also be able to improve the efficiency and transparency of their ballot tabulation thanks to Dominion’s proprietary technology, AuditMark®. This ballot-level audit trail, which shows how the system interpreted the marks on the ballot, is appended to each digital ballot image. This not only ensures that voter intent is accurately captured, but also provides a platform for ballot adjudication and review should it be necessary. Dominion Voting is pleased to have been selected as the partner of choice for this state-wide implementation. In addition to the industry-leading technology described above, Dominion will also provide the state of New Mexico project management and support services to ensure a smooth and efficient transition to the new system.